Glenn Lodden joined ABN AMRO in September 2014. 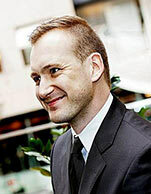 He has previously worked as a shipping equity analyst for DNB and SpareBank 1 Markets. Glenn has a total of 10 years of experience covering global shipping stocks in all shipping sub sectors, and has received several awards in both Norway and Internationally for his work.